Morgan that settled in Milam County area in the mid to late 1860's. Both are buried in Milam County, Texas. I am trying to find any ancestry family history on Lucy, maiden name is either Biddy or Colbert. 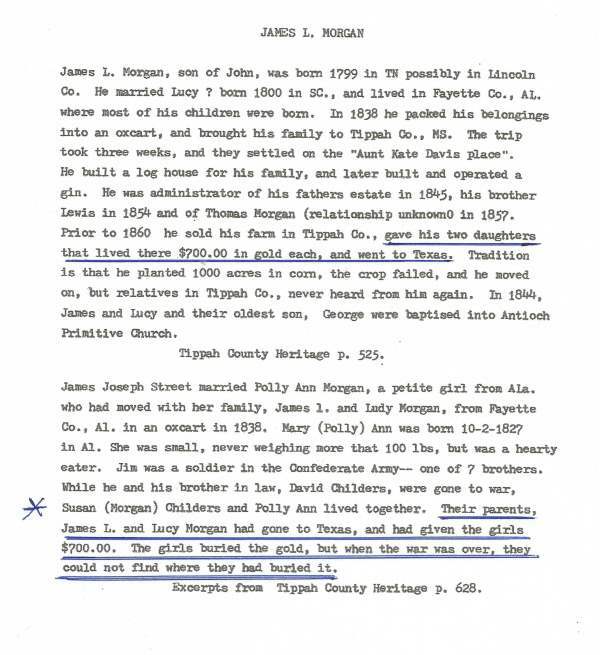 I have checked the books "170 Years of Cemetery Records in Milam County, TX' for James and Lucy Morgan. This was all I found in the records. the M.C. Genealogical Society and others interested in MC history. Perhaps some one will have more info. Email forwarded to MCHC members and others interested in MC History. Lucy Morgan or any of their numerous children expiring during that time frame. the family was not shy about mobility. I'm sure that you are aware of attachment #1 (below) from the Tippah County (MS) Heritage, p. 628. Morgan?. I have not been able to come up with anything additional for her.